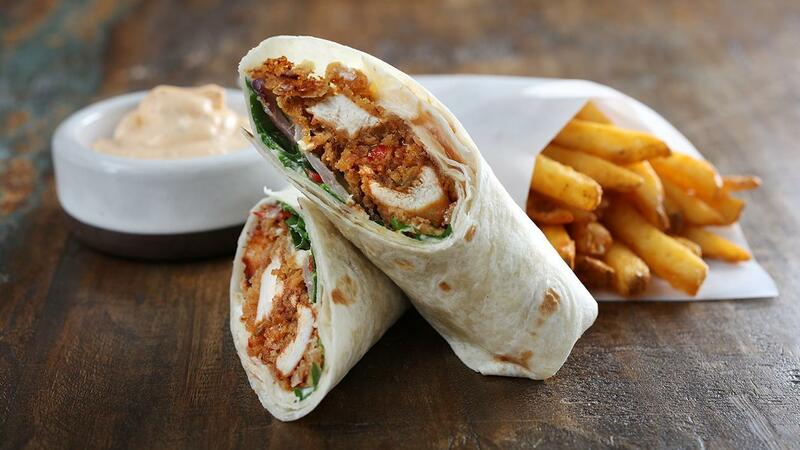 Texture and flavour are the key ingredients to a truly great chicken wrap. We have used Knorr Chicken Seasoning Powder to boost taste, while the texture is garnered by fresh rocket and sautéed vegetables. Finally, no wrap is complete without a magic dressing of garlic, mayo and Sweet Thai Chilli Sauce. A true classic with a contemporary do-over! Marinate the chicken strips with garlic, tomato paste, spice powders, ¾ Knorr Chicken Seasoning Powder, Knorr Lime seasoning Powder, Corn Oil for minimum 2 hours. Add balance Knorr Chicken Seasoning Powder to the flour for extra flavour boost. Keep the ice water ready for the frying technique. To fry with crispy layers: Dust the chicken strips in flour then dip into ice water for a few seconds. Coat the wet chicken once more in the flour creating layers with your fingers by pressing and releasing a few times. Fry the strips last minute until golden brown. Sauté onions and peppers in olive oil until tender. Wash and keep mint leaves for filling. Mix garlic paste with Hellmann's Classic Mayonnaise. Flash heat the tortilla wraps for a few seconds before placing a little mayo on top. Place mint and sautéed vegetables before adding crispy chicken, more garlic mayo and finally Knorr Thai sweet chilli sauce. Close the wrap and serve with French fries.